Number of Human Genes Revised Downward. Again. Genomic researchers in Spain have recently proposed a new, lower number of protein-coding genes in the human genome. Previously, the number of coding genes was estimated by some at nearly 22,000 in the human genome. The new estimate is approximately 19,000 protein-coding genes. How can we use this new information in teaching undergraduate A&P? Well, first we can update the numbers we use when discussing the role of genes in protein synthesis. If it fits with our course objectives, we can use this as a way to transition to a discussion of coding vs. noncoding genes. We also have an opportunity to discuss how science works—we are constantly checking our facts and revising our conclusions to improve the accuracy of our knowledge. And that the story of genomics is far from complete. I often tell students that I'm trying to tell them "the last, best story" of the human body's structure and function. So if my story changes over time, that's a good thing! Press release in plain English based on information provided by researchers. Multiple evidence strands suggest that there may be as few as 19 000 human protein-coding genes. Research article proposing the newly revised number. Open access to full text of article. Want a FREE digital image of the nuclear genome that you can use in your presentation, handout, or other course material? 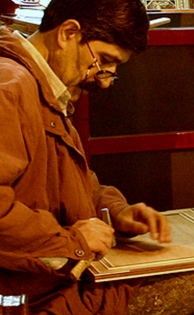 The image above is in the public domain and can be used in your course materials. Researchers recently induced ordinary cardiac muscle fibers into becoming functioning pacemaker cells by injecting a therapeutic gene. Working with pigs, a common model for human cardiovascular research, researchers first destroyed the natural pacemaker cells in each subject's heart and installed an electronic pacemaker. They then inserted a gene for transcription factor TBX18 into cardiac muscle tissue using an adenovirus. 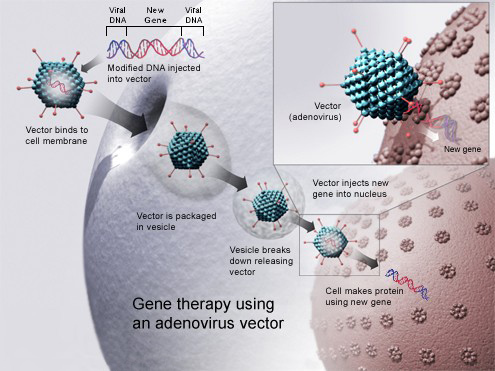 Using adenovirous vectors for inserting genes is a common strategy in gene therapy. Within a couple of days, ordinary myocardial fibers had developed the structure and function of pacemaker cells. In about 5 days, the electronic pacemakers were no longer needed. However, this biological pacemaking peaked at about 8 days, then eventually disappeared. This may occur because the virus-infected cells are probably destroyed by the body's immune defenses. So researchers are thinking that perhaps, at the very least, this could eventually lead to a temporary treatment for certain arrythmias in humans. This is an interesting bit of news that helps illustrate the frontiers of human biomedical sciences. This story provides a good case to provoke a discussion of the nature of gene therapy. Why did the effect last only 8 or so day? What does this tell us about transcription factor TBX18? What benefit might this treatment have if developed for humans? This may add interest to an discussion of the function of the electrical system of the heart in general, and artificial pacemakers in particular. The case also provides a scenario in which the body attacks and destroys virus-infected cells. Plain-English article summarizing the discovery. Includes quotes from the researchers. Have you heard that the American Physiological Society (APS) has expanded their Archive of Teaching Resources into The Life Science Teaching Resource Community? This new online community—LifeSciTRC for short—offers thousands of FREE resources that you can use in your A&P course! This transition marks a culmination of efforts of APS and several other scientific societies to advance the Archive of Teaching Resources beyond an online library into a community of practice for life science educators at the K-12, undergraduate, graduate, and professional levels. I can't speak highly enough of the quality and diversity of teaching resources available in the archive. These are peer-reviewed submissions from all levels of teaching and learning. Case studies, experiments, demonstrations, slide presentations—all kinds of great stuff! The new system is really easy (and fun) to use. It has a starred rating system, so you can see how others have rated each resource. And you can earn badges by submitting and reviewing items. Educators looking for new teaching ideas or interaction with other educators are invited to visit LifeSciTRC.org and discover what they have to offer. For more information, contact our colleague at APS, Miranda Byse, PhD, Program Manager at mbyse@the-aps.org or 240-743-8045. Be sure to tell her where you heard the message! A new study suggests that DNA mutations in some of the mitochondria of healthy people may be a lot more common than scientists thought. The term heteroplasmy describes a situation in which some mitochondria of a cell have mutant mitochondrial DNA (mtDNA) and other mitochondria have normal mtDNA. Cell function can become disordered, perhaps producing disease, when the balance of mutant vs. normal mtDNA crosses a certain threshold. The recent study shows that about 90% of healthy people studied in the 1000 Genomes Project had at least one heteroplasmy. Some of these (about 20%) have been shown to correlate to disease. That's a lot more than we were thinking prior to the study (25%-65% heteroplasmy rate). We don't know the significance of this finding yet, but it could influence how likely it is for mitochondrial diseases to develop over time—or to be inherited. Could the mutant/normal mtDNA balance get skewed as oocytes form, thus giving different offspring different probabilities of inheriting mitochondrial disorders? Or change the probabilities from one generation to the next? Mitochondrial dysfunction is thought to be a mechanism of aging—could the rate of heteroplasmy be part of the aging mechanism? What can we use from this in teaching undergraduate A&P? The fact that we now know that mtDNA mutations are common in healthy people will be interesting and useful to students. This is a plain-English article summarizing the new findings; includes quotes from the researchers. K. Ye et al., Proceedings of the National Academy of Science (PNAS), doi:10.1073/pnas.1403521111, 2014. This is the original research report. Want a FREE labeled image of mtDNA that you can use in your presentation, handout, or other course material?